Chippenham Park has passed by descent in the present owner’s family since 1791. The house itself has been through many incarnations finally being rebuilt in the 1880s in the fashionable Queen Anne revival style. Before that it had been an abbey, a grand country villa, a modest hunting lodge and was nearly rebuilt as a grand neo-classical house by James Wyatt in the 1790s. The Park itself was created in the 1690s by Admiral Russell with the permission of the King, William III. He was later made Lord Orford and First Lord of the Admiralty and planted large avenues in the Park to illustrate the battle formations of La Hogue, his famous naval victory over the French. He died without heir and in 1791 the estate was bought by John Tharp, a hugely successful sugar baron. He greatly enlarged the estate and was passionate about trees, of which he planted many thousands. 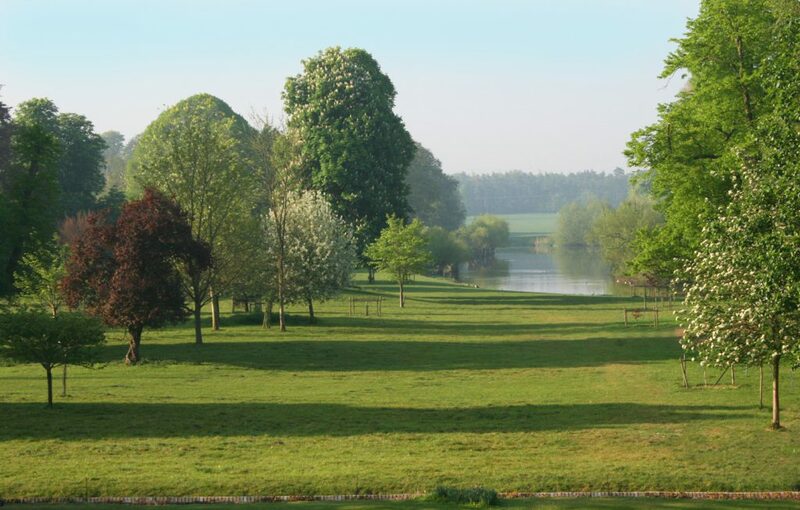 Chippenham Park, near Newmarket, has a rich history. 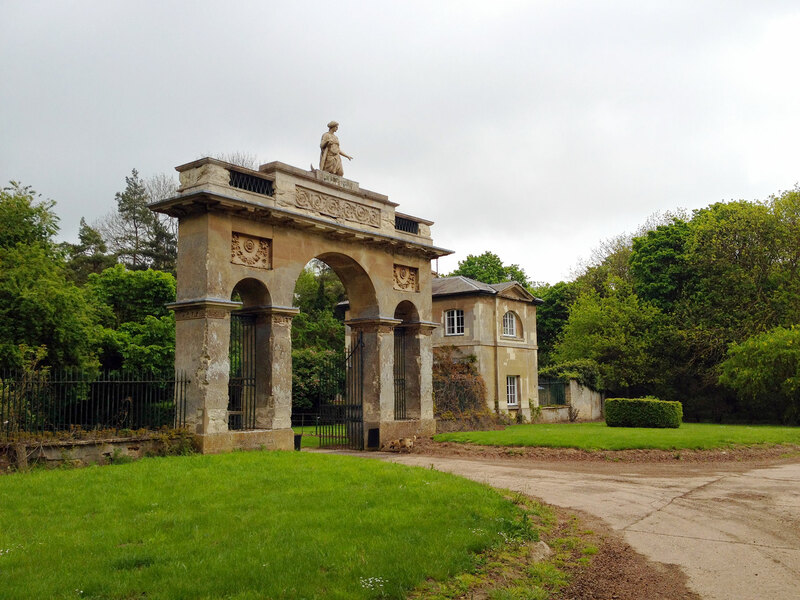 The best stretches of wooded country in the Cambridgeshire landscape often turn out to be the remains of 18th century parks surrounding surprisingly little-known country houses. Typical of these is Chippenham Park, which lies between Ely and Newmarket. The house, seen from the park, appears to be a late 19th century red-brick. neo-Queen Anne country house, typical of those built round Newmarket for shooting and racing parties, indeed, the Prince of Wales and his brother the Duke of Cambridge stayed here for a shoot in 1896. However, the parkland has plantings going back probably 200 to 300 years. To the east of the house stands a handsome late 17th century red brick coach house, and the north court – now the front entrance – still has brickwork of that period. Chippenham Park has clearly been the subject of considerable alterations and remodelling. In 1985 the estate came to Mr and Mrs Eustace Crawley. It had passed by descent in Mrs Crawley’s family since 1791. At that time, the house appears to have been a compact hunting box, carved out of a more substantial 17th century house in the late 1780s. This earlier house was advertised for sale in 1783 as “a most superb magnificent capital Mansion House consisting of rooms of every description, and all convenient offices attached.” It was bought by a banker, Drummond Smith, who reduced it to a mere fraction of its original size. This then was the mansion just before it was acquired by Admiral Russell in 1688. A nephew of the 1st Duke of Bedford, he had served in the household of the Duke of York (later James II) but he was also one of the “Immortal Seven” signatories of the letter which, in 1688, invited William III to come to Britain to “protect the liberties of England.” In 1689 he became treasurer of the Navy, In 1692, he was the victor of La Hogue, defeating a French fleet sent in support of James II. MP for Cambridgeshire, he was created Earl of Orford in 1697. He clearly spent a great deal of money on Chippenham. on rebuilding (or refitting) the house and creating a park. The avenues are thought to have represented the battle formations at La Hogue. First Lord of the Admiralty under Queen Anne and George I, Lord Orford entertained the latter at Chippenham on October 4, 1717. Celia Fiennes who visited Chippenham in 1698 remarked that the dining room had “looking glasse on the two peers between the three windows . . so it shews one from top to toe”. Moreover, “the roomes were all well wanscoated . . . and there was the finest carv’d wood in fruitages herbages, gemms beasts fowles, etc., very thinn and fine all in white wood without paint or varnish, the severall sorts of things thus carv’d were exceeding naturall all round.” The looking glasses in those chambers “were the largest … I ever saw”. This carving (by or in the manner of Gibbons) and the looking glasses were “much talked of”. The paintings mentioned included full-length portraits of the royal family and a large marine painting of La Hogue. The latter, together with several Van de Veldes and a portrait of the Whig “junto”, went to Ombersley Court. Worcestershire.. built by the 1st Lord Sandys in the early 18th century. Lord Sandys’s wife, Laetitia. was Lord Orford’s great-niece and sole heiress. Lord Sandys sold the Chippenham estate in 1749. It was later bought in 1780 by the Mr Smith who pulled the greater portion down. Nothing at all survives of the carving or looking glasses. Tharp, who bought the estate from Smith in 1791. had a large fortune from Jamaican plantations. He leased Home House in Portman Square and clearly intended to establish himself, or his family, among the fashionable gentry. John Tharp’s eldest son, Joseph, was educated in England, at Eton and Trinity College, and served in The Life Guards. He married Lady Susan Murray and it may have been to accommodate them (a son and future heir was born in 1794) that John Tharp engaged James Wyatt to draw up designs for a substantial new house. A full set of these plans (signed and dated June and July 1794) survives. The plans show a substantial new Classical house facing south across the park— the old house and yard were to be retained behind. The entrance elevation was to be divided between a central Corinthian portico, with a single tri-partite window on either side on the ground floor, under a shallow arch. Above each of these a Classical bas-relief is shown. A letter in the Cambridge Record Office, presumably from Tharp’s then agent, reads: “I think Wyatt the quickest and cleverest fellow I ever saw. I am sure if you were here now you would . . . follow his advice implicitly. I am of the opinion he will make you as convenient and elegant a house as any in the kingdom. It will not have the grandeur of Blenheim, but will possess what I think of much more importance, which is comfort”. A sketch on this letter shows a more impressive layout than Wyatt’s finished drawings, and presumably represents an earlier idea. The ground door is shown divided between a central spacious hall opening, through a double screen of columns, to a grand staircase that rose in a semi-circle. To the east of this a grand and a small drawing room were proposed and to the west a dining room and a library. In the finished plan, dated 1794, the south-facing drawing room and dining room are separated by a small hall; to the east is a library, to the west a billiard room separated by a bedroom suite. The only part of these plans to be built was an entrance gateway on the approach road from Newmarket in the manner of a triumphal arch with a pair of lodge cottages, which again bear some comparison to the gateway built to Wyatt’s designs at Dodington Park. The collapse of the project for a new house may have something to do with the unexpected death of Joseph Tharp in 1795, although this did not stop his father adding to the park and acquiring additional neighbouring estates: Badlingham in 1797 and Snailwell in 1798. Tharp returned to Jamaica in 1802 and died in 1804. The estate passed to Joseph’s son. then a minor. Although he married on coming of age to Lady Hannah Hay—a daughter of the 7th Marquess of Tweeddale—Joseph was declared a “lunatic”. The estate remained “in chancery” until his death in 1863. His uncle and cousins ran the estate. There were at least two more attempts to redesign the house which both came to nothing. In 1821. Charles Humfrey, a Cambridge-based architect who had been in Wyatt’s office, drew up more designs for extending the main house. In the late 1850s and 1860s designs by John Moves were drawn up for a neo-Jacobean house. Monty Tharp-Gent inherited in 1875. In the late 1880s he had the house rebuilt in the Queen Anne revival style, raising the existing house by a floor behind three shaped gables. The central hall was recast with a new staircase and the main drawing room was considerably extended to the east with a single-storey addition. The architect is not known, but the style is consistent with a number of good houses of this date by architects such as W. Young and A. N. Prentice. Built round Newmarket for racing enthusiasts, many of these houses are now racing stables. A few alterations were made by Paul Phipps, a pupil of Lutyens, in 1933. He moved the entrance from the south east corner to the middle of the north front. The 1880s entrance hall became a loggia and the 1880s conservatory, on the south west corner, was converted into a substantial dining room which is still used today. The staircase hall and the large drawing room remain as they were designed in the 1880s. while the library between the hall and dining room may have been formed by Phipps for Mrs Crawley’s great-aunt. The estate passed to Mrs Crawley in 1985. Together with her husband, and advised by Messrs Bidwells of Cambridge, they have restored and refurbished the main house and most of the buildings on the still large estate. The garden has been extended from five acres to 15, and is very popular on the days that it is open.